Guest author Robert Ernst has been an Associate Editor in the area of workplace safety at J.J. Keller & Associates for 12 years. He focuses on OSHA standards, workplace safety issues, right-to-know compliance and first aid, among other topics. At Keller, Bob is responsible for providing content for online and print products and is a frequent speaker and presenter at professional events. He also answers technical and regulatory questions from Keller customers. On March 26, 2012, OSHA’s final Hazard Communication Standard (HCS) was published in the Federal Register. 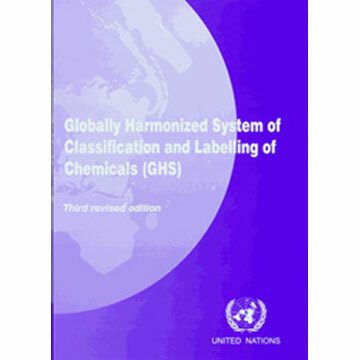 The HCS is now aligned with the Globally Harmonized System of Classification and Labeling of Chemicals (GHS). This will improve the quality and consistency of hazard information in the workplace, making it safer for workers by providing easily understandable information on appropriate handling and safe use of hazardous chemicals, as well as harmonizing U.S. hazard communication rules with those used internationally. The GHS is an international approach to hazard communication, providing criteria for classification of chemical hazards, and a standardized approach to label elements and safety data sheets. The GHS provides harmonized classification criteria for health, physical, and environmental hazards of chemicals. OSHA does not address environmental hazards in the HCS. The three major areas of change are in hazard classification, labels, and safety data sheets. Hazard classification: The definitions of hazard have been changed to provide specific criteria for classification of health and physical hazards, as well as classification of mixtures. These specific criteria will help to ensure that evaluations of hazardous effects are consistent across manufacturers, and that labels and safety data sheets are more accurate as a result. OSHA does not include environmental hazards in the HCS. How will chemical hazard evaluation change under the revised Hazard Communication Standard? The revised HCS has specific criteria for each of the 9 health and 16 physical hazards, along with detailed instructions for hazard evaluation and determinations as to how mixtures are evaluated. OSHA will not address environmental hazards. The HCS also establishes both hazard classes and hazard categories—most hazard classes are sub-divided into categories that determine label requirements. 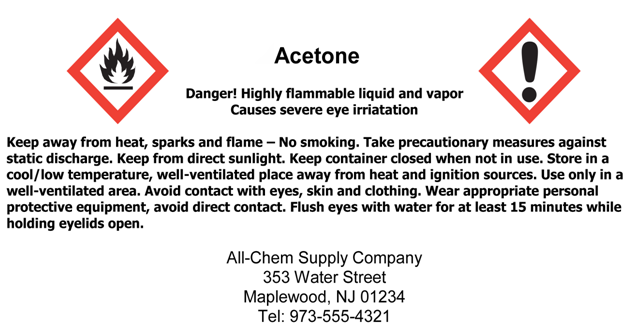 Product identifier: the name or number used for a hazardous chemical on a label or in the SDS. It provides a unique means by which the user can identify the chemical. The product identifier used shall permit cross-references to be made among the list of hazardous chemicals required in the written hazard communication program, the label and the SDS. Pictogram: a symbol on a white background within a red diamond. There are nine pictograms under the GHS. However, only eight pictograms are required under the HCS. View examples of pictograms. Signal words: a single word used to indicate the relative level of severity of hazard and alert the reader to a potential hazard on the label. The signal words used are “danger” for the more severe hazards, while “warning” is used for less severe hazards. Precautionary Statement: a phrase that describes recommended measures to be taken to minimize or prevent adverse effects resulting from exposure to a hazardous chemical or improper storage or handling of a hazardous chemical. Supplier information: name, address, and telephone number of the chemical manufacturer, importer, or other responsible party. Once the hazard classification is completed, the chemical’s hazard class and category will dictate the pictogram, signal word(s), hazard statement(s), and precautionary statement(s) that must be used on the label, and which must appear on the SDS. Read more Hazard Communication and GHS Frequently Asked Questions from J. J. Keller. Copyright © 2012 J.J. Keller & Associates, Inc. All rights reserved. Copied by permission.